Since the formation of the partly railway-owned Huddersfield Joint Omnibus Committee in May 1930, the arrangement had been that tram and trolleybus routes, irrespective of whether they ran within or without the borough, were to remain the business of the Corporation, and that all motorbus routes would be run by the JOC – a very different arrangement to JOC agreements elsewhere. When the Corporation finally made a decision to abandon trolleybuses from 1961 and replace them with motorbuses, then the converted routes would remain in Corporation control. With the introduction of motorbuses on the 30 Almondbury to West Vale route in November 1961, eight Leyland PD3A/2’s with Roe H39/31F bodies (401-408, UCX 401-408) were delivered – a new type for Huddersfield – in a streamlined variation of the livery. They were not well received at the time, being considered noisy and slow, adding considerably to the time taken to climb from Elland to Ainley Top up the steeply graded ‘Ainleys’ compared to the trolleybuses. For the next conversions a further 16 of the same type were purchased (409-424, WVH 409-424), delivered in two batches in late 1962/early 1963. Eight similar, but shorter PD2A/24’s were bought for the JOC later in 1963, being in the JOC’s more conventional three-cream-banded livery, but then allegiance switched to Daimler products. Trolleybuses were abandoned altogether in 1968, and in October 1969 the Corporation took over the former railway-owned share of the JOC, as well as the local stage services of Hanson’s Buses Ltd, so from then the operation was all ‘Corporation’. Someone then suggested a new version of the livery should be introduced for the newly combined operation, and 419 (as seen above) was duly turned out in this scheme that can surely only be described as truly dreadful – rather like the drab Hanson all-over red with a cream front. Here it is seen in John William Street in September 1970. Thankfully, this particular idea was not adopted. Following the formation of the West Yorkshire PTE twelve of the WVH-registered buses were transferred to Halifax (Metro Calderdale), including 419 – soon after renumbered 4419. All but one were repainted into WYPTE livery and soldiered on having quite a hard life on Halifax’s arduous routes, 4419 being withdrawn in September 1979, then sold at auction to a scrap dealer. The last one (4418) was withdrawn in February 1980 being one of the last three halfcabs in the Halifax fleet. Of the ones that remained at Huddersfield, some were sold for further service with OK Motor Services of Bishop Auckland, in whose livery they looked superb. One was later used as a static restroom and changing facility at the Beamish Open Air Museum, painted allover grey, but is believed not to have survived. John says these buses were not popular when introduced. I think any motorbuses which replaced trolleybuses were on a hiding to nothing especially in such hilly terrain where passengers were used to a silent climb up the long slog to Ainley Top. The same happened in Bradford where the AEC Regent V’s got a bad reputation for noise and vibration when they took over from the trolleys on the climb up to Wibsey and Buttershaw. Bradford compounded the problem by moving to synchromesh gearboxes so in addition to the engine noise passengers were treated to the screaming whine from the gearbox. Much as I loved trolleybuses Philip, and I did love them, if I’d been a resident of Wibsey or Buttershaw I’d have raised no objection at all and indeed I’d have been delighted, to enjoy the symphony that you mention coming from the gearboxes of the Regent Vs. If the totally unnecessary bad driving sadly so characteristic of many of the Bradford chaps on the Mark Vs had caused any injury or bruising I’d have had to follow the advice of the wonderful J. Stanley King and purchase some embrocation !! Oh to go back to the wonderful days of the 1940s/50s/60s when virtually every make and model had such character and individuality. Indeed so, CY! We can of course sample these delights during rallies and running days, but it isn’t the same as experiencing them in normal service. Someone has commented on here in the past – I suspect it might have been Roger Cox – about having ‘steering technicians’ these days instead of drivers. All they are able to do is aim the vehicle; everything else is done automatically. When the Optare Deltas first came into service – sorry, folks! – Marchwood Motorways had some. Drivers of more traditional vehicles commented that they didn’t have even the rudimentary gear stick of a normal automatic, just three buttons: go forward, go backward, and park it. It worries me that some fleets now have them in their ‘driving schools’! Intended specifically for those ‘steering technicians’, perhaps? My memory of trolleybuses in Nottingham is that they were certainly quiet and powerful, even on steep gradients, but smooth they were not! The superb acceleration was achieved in a series of sudden sharp thrusts – reminiscent of an aircraft take-off. They couldn’t compare for smoothness with the huge fleet of pre-selector Regent IIIs. The Leyland PD3, though undeniably a reliable plodder, was never a scintillating performer, and its braking characteristics left much to be desired. During my time in Halifax, the HPTD contribution to the 43 Halifax – Huddersfield service which traversed the Ainleys en route always consisted of PD2s which ascended the long, steep gradient steadily if not spectacularly. The Halifax JOC PD3s were generally relegated to the rather less demanding Hebden Bridge – Brighouse services. The prospect of going down the Ainleys with a PD3 would not have inspired confidence in me – I suspect that third gear would have been required to obviate severe brake fade on entering Elland. The ‘streamlined’ colour scheme of the Huddersfield Corporation fleet looked quite smart to my eye, as, indeed, did the more restrained JOC version of the livery. As John remarks, the appearance of the bus in the picture is absolutely terrible. I would suspect that this idea emerged from the engineering department where considerations of painting costs rather than presentational image took precedence. Bus sounds of old certainly stick in your mind. We had Regent V’s in Rochdale but they were of a special breed. Fitted with Gardner engines and preselector gearboxes they used to bark their way up Drake Street and then at the top would give that characteristic little jump forward as the driver pressed the gearchange pedal to change up. No screaming or whining from these beauties. And oh that livery! With all due respect to the old-timers (being one myself!) I think your remarks about steering technicians is unnecessarily harsh. With the volume of traffic on the roads and the abysmal driving standards generally anything to make the drivers job easier is to be applauded. Would you like to drive a bus with a crash gearbox on todays roads while collecting fares and dealing with the idiots on the roads and the moaning "t’wearlies" at every stop and behind you not to mention the drunken yobs on lates? I thought not. I have never driven an automatic bus in my life (and very few semi-automatics), but if I were city bus driving today I would be grateful to have either ! At Reading Buses on Friday during a break on the 2016 Royal Blue Run one of the female technical apprentices asked what the long lever with the ball on top was for ie gearlever-she was being serious! Malcolm I know exactly what you mean about today’s road and service conditions and nowadays you are right. As one who had to suffer many new fangled fully automatic systems in the 1960s/70s though I have to say that several of these were violent in behaviour and in certain circumstances downright dangerous. Take for example the first batch of 33 foot Fleetlines of LCT which incorporated a "kick down" facility – the very title says it all. Upon approaching a roundabout if you wished to change down you had to slam the accelerator pedal to the floor whereupon the infant electronics should have selected a lower gear. this failed more often than it worked and so, aided by the legendary torque of the Gardner engine, you were propelled towards the hazard at speed in top gear, or which ever ratio had been too high as you "kicked down." On the other hand, and to be fair, all the modern systems leave me breathless with admiration as they "read" the road situation with incredible precision and change up and down imperceptively. The only exception in my experience were the dreadful Leyland Lynxes in which the ZF gearboxes regularly malfunctioned and "missed" third and other gears, causing the Cummins engines to scream to full revs in neutral and before your could ease off the gear would then engage with a violent thud – causing universal loud condemnation from the victims within "They’ve some rough drivers on this firm, we don’t know where they get them from." The same could and did occur as you braked smoothly and the ZF decided to change down in a similar fierce manner, resulting in "Oooh this fella’s ‘evvy on his brakes" from within. Speaking now admittedly with "forked tongue" I have to say that as an enthusiast I would gladly enjoy a live gearbox on urban service work, but I realise that’s an exceptional view. Interesting use of the word "Kickdown". In automatic cars the kickdown was to engage a lower gear but for acceleration rather than deceleration. I seem to have kicked over the ant-hill! I was not intending to denigrate today’s bus and coach drivers, for most of them do a fine job with the equipment they are given. As Chris says, some vehicles in the not too distant past have been dire in the way they have changed gear. First in Southampton have some Volvo double deckers (W801 series) which sound as if they are desperate for a gearchange, but I’m told that it’s actually the cooling fans . . . I used to work for Southampton City Council on the traffic management side, and was the only one in the team who had ever driven a bus (though not on public service). Even my manager hadn’t. 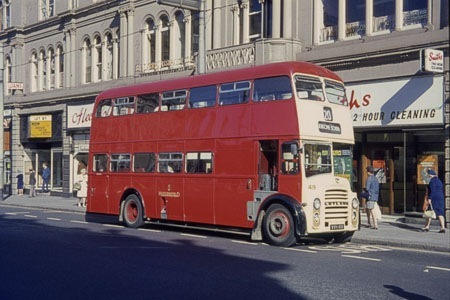 I took advantage of an invitation in the booking office window of the old Hants & Dorset Bus Station in Southampton – it was Hampshire Bus by then: "If you’ve ever wondered what it’s like to drive a bus, pay us £10 and have a trial hour." It was a Lodekka trainer of the EMR…D series, crash gearbox, so double declutch every move, and a big stick. At least it gave me some idea of what the bus driver had to contend with. With reference to Roger Burdett’s comment, I was once told about two coach drivers who had been sent to collect a pair of new vehicles. I believe they were Neoplan Skyliners. The drivers inspected the exteriors and then had a quick look inside. They were appalled by what they found, and there then followed an urgent call to office. "We can’t drive these, boss. We’re only licensed for two pedals and a wrist-flicker, but these have three pedals and a big stick! HELP!" At least the ‘wrist-flicker’ is more like a real gearchange than the three buttons I mentioned. Too true Pete – when the first "buttons" Olympian was delivered to SYRT my heart sank and my fears intensified when we were taken out on "familiarisation" runs and I found that the Company had fitted a plate over the original "1, 2 and 3" buttons taking away any emergency control from the driver. My immediate protest about legality (in which I was eventually proved wrong it seems) encourages this unbelievably fatuous sneer from the uninformed senior fitter that "We’ve blanked them off to prevent you mad drivers from thrashing it in lower gears." I still after 28 years cannot believe I heard that. When I took my objections to the General Manager I was told "Oh well if you don’t like it, take a screwdriver with you and remove the plate while you’re driving", to which I politely replied that I supposed that I should then be sacked for interfering with the bus. So it was that the famous 107 "TWY 7", which should of course have had an E *** *** number, leapt and jerked its misbehaved ZF way along, often in the wrong gear, especially in heavy urban traffic. The same "Company Luddite" treatment was afflicted upon the next two Olympians also. I retired in 2001 and I can’t for certain remember now, but possibly the offending plates were removed from the gear buttons eventually. I’m talking now of course about the earliest versions of the "button" method and as I’ve said elsewhere the modern gearboxes are intelligent and faultless to a commendable and amazing degree, so credit where its due. To my traditional standards though, the buttons always reminded me of the "long, medium and short" wavelength buttons on old radio sets, rather than anything automobile. The link below shows the first UK bus with three button gear control. Chris, the ZF box, if properly maintained, was probably the best of the earlier auto systems in double deckers, though the Allison in single decks was OK. The sequence of torque converters with lock up at each stage effectively gave five gears, and the hold down buttons for the intermediate stages allowed some measure of driver control to considerable advantage. The policy you mention of plating over these buttons was stupid and insulting. If neglected, the ZF box could certainly behave in the wayward manner you describe, with thumping, rough changes at illogical speeds, but this was definitely a maintenance issue. Some of the Viscount (i.e. Cambus) Olympians of the Peterborough area displayed these symptoms, but in regular driving one did get to sense that the thing was about to change gear upwards, and easing the accelerator at that point alleviated the bang. Slowing down was another matter, and nothing could be done to minimise the savage lurch and thump of the lower gear engagement. By contrast, the Olympians at Huntingdon & District were better maintained, and the ZF gearboxes there behaved entirely properly. To my mind the worst of the earlier bus autos was the three speed Voith box that Stagecoach specified in the Volvo Olympian. With these, the engine had to be taken up to screaming full revs before the thing would change up, and, on slowing down, the lower gear would lurch in again at ridiculously high road speeds. When the bus was held in gear for more than a few seconds, such as when waiting to enter a roundabout, the Voith automatically engaged neutral, so that, when the accelerator was depressed to move off, the engine would speed up a bit before the gearbox engaged with a lurch. Several valuable seconds would thus be lost in trying to get the bus going again, and coupled with the miserable low speed torque of the Volvo engine, moving off could be decidedly sluggish and hairy in some circumstances. At Peterborough, the southern exit from Queensgate Bus Station is on a rising gradient into a fast, busy roundabout, and these Volvo Olympians were hopeless at getting out. Similar nightmares would be experienced re-entering the A1 traffic from village side roads, pulling into the A605 at Elton, crossing the A47 at Wansford……… I won’t go on. The Voith may have been simple and easier to maintain, but it was hopeless on the road. At Ramsey, our ZF Gardner Olympians would just about run for two days on one fill up. The replacement Voith Volvos had to be refuelled twice in one day. Yes, the modern transmissions do seem to behave better, but I retired (thankfully) in 2006, so I don’t have any practical driving experience with them. 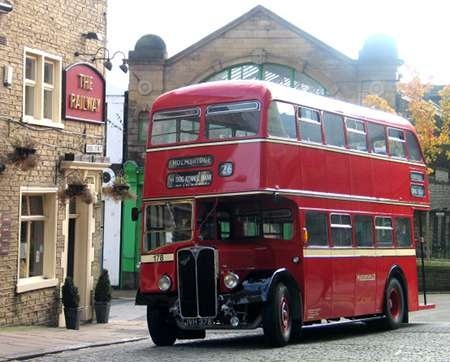 Arriving at the Piece Hall, Halifax, for the Heart of the Pennines Rally of October 2011 is Huddersfield 178. This is AEC Regent III 9613E 4927, bearing East Lancs body number 5107. 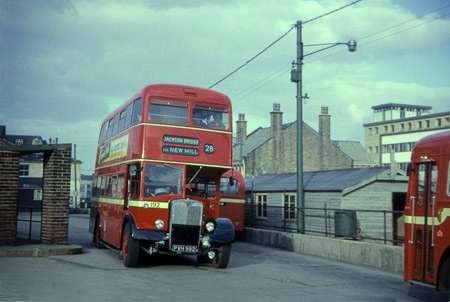 This bus was new to Huddersfield in June 1955. Lovely picture. This style of East Lancs body was much more common on the Leyland PD2 and was especially popular with a host of Lancashire municipalities usually with exposed radiator. Rochdale had five virtually identical Regent III’s and Bradford had some similar but with the Birmingham style tin fronts. The Huddersfield livery just exudes class with such a splendid shade of red. Thanks Phil, Given the level of loyalty of many West Riding area operators to Roe, I wonder what caused Huddersfield to go to ‘the dark side’ for these? I think these exposed-rad Regents looked so much better than those with the ‘Birmingham style’ fronts. On the subject of exposed radiators, I think most of us nowadays prefer them to "tin fronts" on buses of this era, but at the time, I’m not so sure. Personally I was very impressed with all things enclosed, but then, I was just coming up to my ninth birthday when 178 was delivered, so my views probably wouldn’t count for much. I think the point is that because of the total revolution in the appearance of single-deckers and coaches which had recently occurred, there would be a widespread feeling that exposed radiators belonged on yesterday’s buses, and today’s buses needed a different look. Now of course we look on old buses with reverence, so an exposed radiator denotes a thoroughbred, and any attempt to disguise it detracts from its appeal. A couple of items to note about 178, firstly we reactivated it (along with a couple of similar buses with valid CoFs) in September 1973 to allow the loan of some PD3As to Sheffield to help out in one of their vehicle crises. Secondly, shortly after the PTE was formed in April 1974 my ex boss, by then in Engineering charge at Bradford borrowed 178 and similar to help with a vehicle crisis there. I don’t recall 178 returning to Huddersfield and may have stayed with Bradford until withdrawal.